Lately my old web provider told me that he discontinued his service. So I was forced to change my OTN notification e-mail address or username which still used this old provider. After reading some thread about this, I was not exactly thrilled to do this. Well, there was nothing I could do about it so I decided to ask support how I could minimize the risk of loosing my identity. You find the OTN account help here. It’s hidden in the ‘GETTING HELP ON LOGIN ISSUES’ section as link ‘Submit a help request’. 1) Delete browser cookies, Close and re-open a new browser window. 2) Go to https://myprofile.oracle.com/EndUser/faces/profile/sso/updateUser.jspx, which will take the user to Single Sign On page. Login using your account credentails. 3) Click “Change Username” link on the top right hand corner of the page and a pop up box will appear. 4) Now Type the password of the account for Current Password field, type the new email address (which you want the account to be associated) for New Username field and Similarly type the same email address for Confirm New Username field and Click “Change” button. 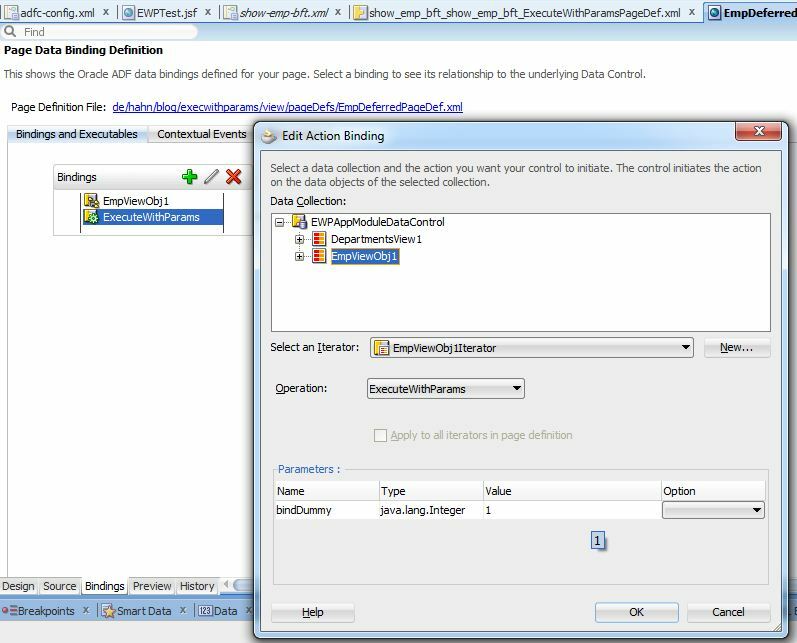 That’s easy enough and worked out OK.
Back in 2009 Andrejus Baranovskis blogged about how to prevent the execution of a (default) query when ADF loads a page here. This is sometimes necessary if the query defined for a page consumes a lot of time or return a lot of rows. Lately some users reporting that the solution provided in the blog mentioned does not work. I have to confess, that I did not try out the method, so I can’t really comment on that. In this blog I show a different way to archive this. The idea I implement is to add a part to the where clause of the VO which, when executed, return no rows. So I don’t prevent the execution but ensure that no row is returned. The next challenge is to control the bind variable from the UI. Here ADF Task Flows comes to help. 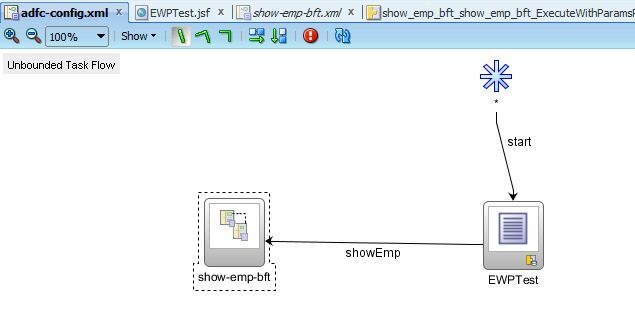 A bounded task flow has a start activity which is executed whenever the bounded task flow is started. I use this start activity to set the bind variable to ‘0’ to prevent the return of any row. Then, on the page I have a button which sets the bind variable to ‘1’ and execute the query. This time I get the desired result. I use the EWPTest ViewId to start the sample. On this page I add a button ‘Show Emplyoees’ which navigates to the bounded task flow ‘show-emp-bft’. 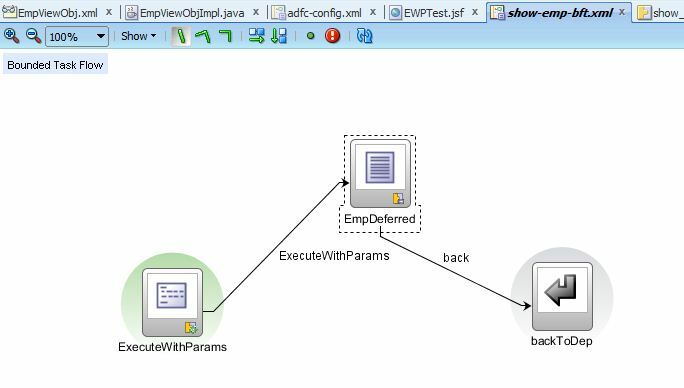 In this task flow the start activity is ‘ExecuteWithParams’ which sets the bind variable to ‘0’. Here is the page def file for the start activity. As you see this method call activity call ‘ExecuteWithParams’ and sets the bind variable to ‘0’ thus preventing the return of any row from the query. As a result the next page only shows an empty table. The ‘Back’ button in the toolbar return from the task flow to the first page. If I hit the ‘Show employees’ again the bind variable is set to ‘0’ again and the query again does not return any row. 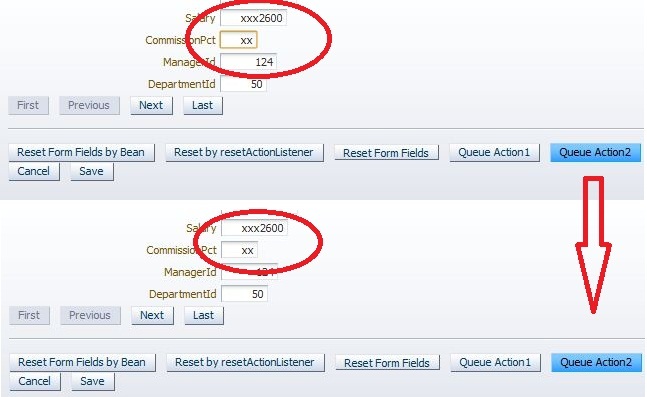 In the last couple of weeks I saw some posts on JDeveloper & ADF forum asking how to reset form fields when the user had changed some or all fields of an input form and wants to undo the changes. This is a typical use case when you work with forms to enter or change data. In this blog I summarize the different possible solutions build in the ADF framework. The sample provided for you to analyze is build using JDeveloper 11.1.2.1.0 and uses the HR schema. A link to download the workspace is provided at the end of the blog post. Before I go into the different solutions, I like to point out that all solutions can only reset values to the last data model state if they are not submitted. After a value is submitted the reset operation will show the same value as in the UI. If you e.g. navigate to the next record all values are submitted to the data model (not the db). Calling reset after you go back to the previous record you’ll see no change as the values are already submitted. As an implication you need to make sure that the action component (button, listener…) uses the immediate property set to ‘true’. If the immediate property is set to ‘false’ the action first updates the model after which no reset is possible. In this case you can only rollback the transaction to get the old values back. 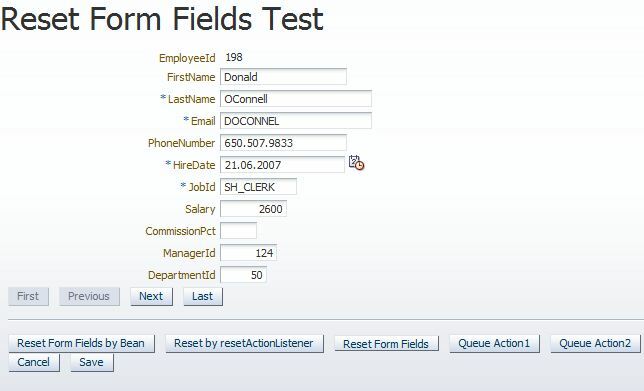 As you see it’s just the employees table dropped as adf form on a jsf page with navigation buttons and an other row of buttons to demonstrate the different possible solution for the use case. First I show how to use java code in a bean to reset the changes made in the form. Next I use a command button with an af:resetActionListener attached. Then there is the new af:resetButton which was introduced in JDev 11.1.2.0.0 and is essentially like the previous solution. As a variation I added two buttons which I use to queue an action from inside a bean method to the second and third buttons. Finally there is cancel button which does a rollback of the transaction. This rollback undo changes even if you navigate back and forth over the row set. 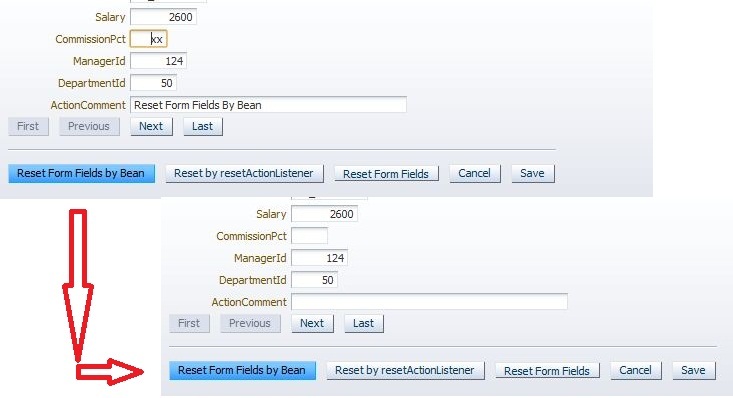 The button ‘Reset Form Fields by Bean’ uses an action listener to call a method in a request scope bean. This method then resets the form fields using the ResetUtils.reset(UIComponent start); method to do the work. The ResetUtils.reset(UIComponent start) method walks up the component tree to find the first UIForm, UIXForm, UIXSubform, UIXRegion, UIXPopup, RichCarousel or RichPanelCollection component. Any one of this components are used as container elements for input components (inputText, inputDate …) which are reset to the values stored in the model data. This allows to only reset part of the input components on a page. So passing the right start component to the reset method is essential. In the simple layout I used in the sample it’s OK to use the button which has the actionListener attached. The af:form is the container found by the ResetUtils.reset(UIComponent start) method. The ResetUtils.reset(UIComponent start); can be used from other bean code too. In this case you need to set a component as start component. Which component you use depends on your page layout. This was the default solution in JDev 11.1.1.x.0. You attach an af:resetActionListener to an other command component and when an action is triggered the reset take place. See solution 4 for a variation. This component was introduced with JDev 11.1.2.0.0 and works like a command button with an attached af:resetActionListener. Advantage is that you have only the button, nothing attached which makes it more clear to understand. 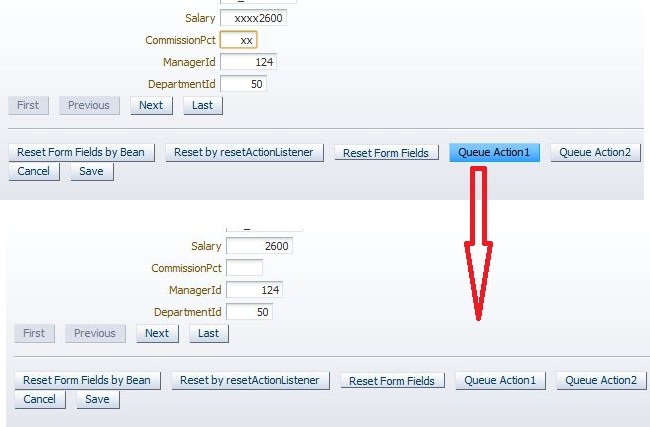 <af:commandButton text="Queue Action1 " id="cb9"
and in the bean I queue an action to the button with the attached af:resetActionLisener. This button is bound to a bean property to keep things simple. Like in solution 4 I use an existing button (the af:resetButton in this case) and queue an action on this button using java code in a bean. and the code in the bean looks like in solution 4, only the button the action is queued on differs. Now, if you carefully look at the result of this action you’ll notice that nothing has happened. I filed an SR for this, resulting in bug 13802277 ‘QUEUEING AN ACTION EVENT ON AN RICHRESETBUTTON DOESN’T WORK’. This solution just call the rollback of the data control. This give you the values back which are stored in the DB. 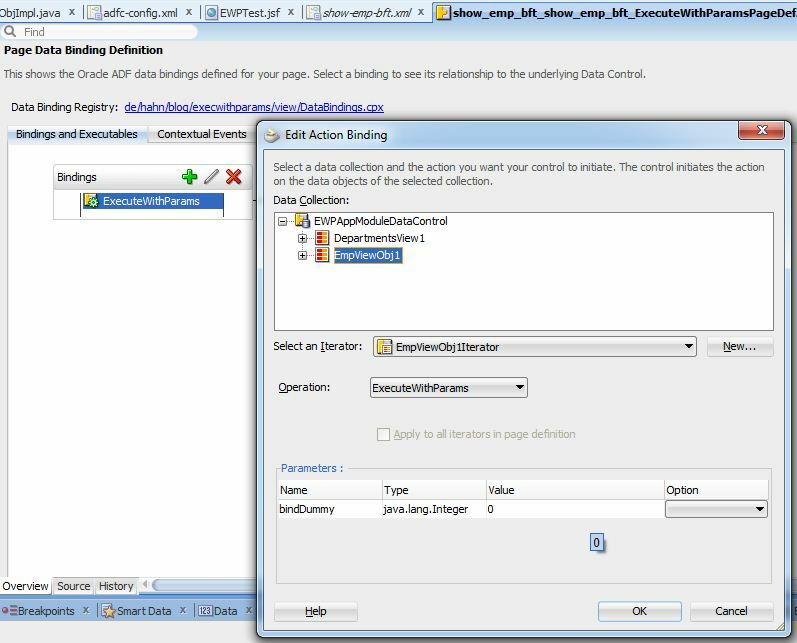 This allows even to reset changes which where submitted to the data model, but where not persisted in the db. Today I received a surprise package, or better the notification of the parcel service, that there is one waiting for me at my neighbors. You know the game we start to play: Do we expect a package? 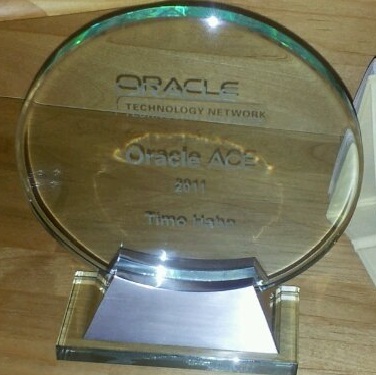 It turned out that the package was send by Oracle. Still no clue what’a in.